There were two predominant views of Frank Marino in the '70s. The first was that he fit into the guitar hero group of such people as Pat Travers, Ted Nugent, and Robin Trower. The second was that he was a bit of a Jimi Hendrix clone. 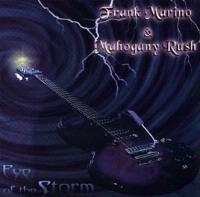 Well, 2001 sees Marino releasing Eye of the Storm with his longtime group Mahogany Rush. It also shows that the guitar hero title still fits, although perhaps the guitar heroes of today differ from those of the '70s. Marino's sound certainly fits into his era more than the 2000's, but that does not stop him from producing a killer album. His guitar textures are not too flashy, but very tasteful. As to the Hendrix reference, those influences can be heard on occasion, but really Marino has his own sound. This release is a very strong rock album that even touches on sounds as far away from Hendrix as ELP and Tomita. In fact, the first cut on the disc, an instrumental introduction sort of number, really seems to blend the sound of both of those groups in an arrangement that feels a bit like a take on Mars, from Holtz' The Planets. Marino is back, and back in style. 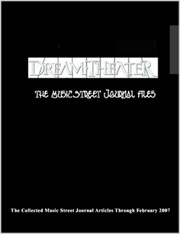 This review is available in book format (hardcover and paperback) in Music Street Journal: 2001 Year Book Volume 3 at lulu.com/strangesound. This instrumental intro comes across a bit like an ELP reading of Mars from Holtz' The Planets. This is a very dramatic intro to "Eye of the Storm", both the album and the song. This one comes in dramatic and psychedelic, but still very modern sounding at the same time. After a brief more laid back guitar vocal based verse, the guitar kicks in in a killer hard rocking riff and begins building from there. Various elements emerge as the song begins its gradual growth. Eastern textures and Zeppelinish tones merge with other sounds in this arrangement. This is one of the best hard rocking jams ever recorded - think Zeppelin's "Kashmir" if you want idea of how strong this one is. This is a great rocking jam, a guitar showcase. It also slips into Eastern toned territory in its nearly 10 ½ minute duration. This cut is of the hard rocking bluesy variety that earned Marino the comparisons to Hendrix, but it really has as much in common with the Allman Brothers as it does with Jimi. No, this is not a cover of the Asia song by the same name. This one is a wonderfully textured, slightly bluesy jam that seems a bit like a more mainstream Santanaish cut. It has a catchy chorus and some killer jamming. This is another extended piece. It drops into a great retro sounding jam that gets a bit Deadish at times, but with that Santana oriented sound always there. A hard-edged, great rocking jam, this one kicks out in a bluesy sort of mode. The Hendrixish textures do show up here. This is a retro tinged, somewhat bluesy love to song - to Marino's daughters. "Since you came into my life, my life's been fun all the time." With a very proggy intro, this one comes across as a jazzy, slightly hard-edged prog piece. This instrumental is a classic fusion oriented jam. Starting off slowly, this is a retro rocking jam that slowly builds in a bluesy rock manner. A killer progish jam ensues after a time. This jam again invites the Hendrix comparisons, feeling a bit like the free form jamming section of "Third Stone…"